If you work with video, chances are you occasionally need to convert video files from one format to another. For instance, if you’ve downloaded videos from YouTube or other online video services, that content may be in Flash or Windows Media formats, which aren’t viewable on any iOS device. Or if you update web content, you may have a number of movies in H.264 format that simply won’t play in Google’s Chrome browser, which doesn’t support H.264. There are many tools available for converting video between formats, but the one I often turn to is the free Miro Video Converter ( ). While its interface isn’t what you would call Mac-standard, the program does a great job converting videos. It supports a huge number of video formats, including some oddball ones, and it can output video optimized for iOS devices, as well as for a slew of Android devices including the Kindle Fire. When you launch Miro Video Converter, you’re greeted with a large, dark, and basically empty interface. However, it’s pretty obvious what needs to be done, thanks to explanatory text that states, “Drag videos here or Choose Files.” To convert one or more video files, drag them into the window, or click the Choose Files link to use a standard OS X file-navigation dialog box to select them. In this example, I’m converting Flash videos for viewing on an iPhone 5. Once you’re added at least one video, the buttons at the bottom of the interface become active. Choose your output format by clicking one of these buttons (Apple, Android, Other, or Format) and choosing from the options in the resulting pop-up menu. Miro Video Converter automatically selects the resulting video’s size, quality, and codec settings based on the chosen platform or device. 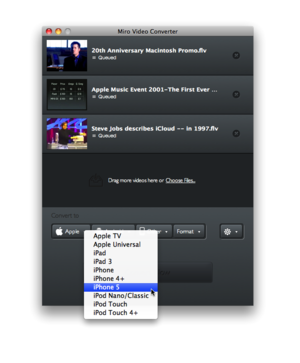 The limited settings available for video being converted for an iPhone 5. As far as settings go, this is it for Miro Video Converter; the program doesn’t even have a Preferences screen. Notice, too, the Show Output Folder link, which opens the folder (~/Movies/Miro Video Converter) to which Miro Video Converter saves all converted video—as with conversion settings, you have no control over where this folder is located. Once you’ve selected your output format, just click the big, green "Convert" button that appears, and Miro Video Converter converts all queued videos. When it’s done—as with all video-conversion utilities, the process can take a while, especially for lengthy videos—you’ll find the converted files in the expected location, with your source files untouched. It may seem like Miro Video Converter presents a number of issues: a lack of preferences, no way to see or change the conversion settings, and no option for setting the output destination. But it’s these same “issues” that make the program incredibly easy to use: Drag and drop a number of videos, choose your device type, click the Convert button, then open your Movies folder to see the converted videos. It really doesn’t get much easier. Out of hundreds of videos I've converted using Miro Video Converter, only two turned out bad, and those were files I converted to Ogg format. If you need total control over your video conversion, Miro Video Converter isn’t the tool for you. But if you’re looking for a simple tool for converting video between formats, Miro Video Converter is worth a look. It’s amazingly easy to use, and you can’t beat the price.